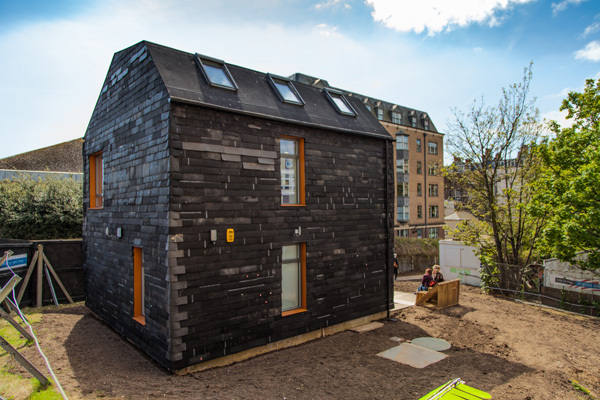 “Tucked away at the rear of the University of Brighton’s Grand Parade site, the finishing touches are being applied to The Waste House, a fascinating new building…. Thanks to Liz for this tip. The UK’s residential building codes are ridiculously convoluted (even more so than the US’ codes), so this really doesn’t surprise me. What would surprise me would be if this house actually cost less (or at least the same) as any other conventionally-built UK-regulation house of equal size. I would bet that this house actually cost MORE than a similar house built under the normal conditions and using the normal methods, especially if all the laborers (skilled and unskilled) were paid normal rates. I’ve seen a couple of these projects where the builders claim the house was so much cheaper than normal, but it was only because the labor was essentially free or “donated”. “…for thought: for every 5 houses constructed in the UK, there is enough waste material generated to build an additional house.” Something is serious wrong with our society.